Carol Messner Lebeaux (’37) shared an unpublished true story she wrote about an adventure in activism with her classmate Judy Churchill Skinner, acting as intrepid ten-year-olds who took it upon themselves to monitor the health and safety of local NYC work-horses in 1934. Judy’s husband, Andy Skinner says of the story: “That’s my Judy, I kept thinking. Always rushing headlong into great causes. She had tremendous determination to make the world a better place.” Their story is a great testament to the C&C education that gave them the confidence, sense of justice and can-do spirit that set the foundation for their venture in animal advocacy. You can read the story and an in-depth update from Carol below. What have you been doing since graduating from C&C? After C&C, I went to LaGuardia High School of Music and Art as an art major. It was a great experience with intense art classes every day in addition to a challenging academic curriculum. From there, I went to Barnard College for two years and then took courses at the Art Students League. I guess you could say I’ve been innovative to have earned my living all these year but never had a “real job.” My various careers were always in the arts with direct connection to the C&C experience. Around 1947, I bought a small kiln and created a line of ceramic jewelry. The years doing clay work at C&C inspired me to get my hands into clay and glazes again. I sold my work to fine shops on Fifth Avenue during the Korean War. The metal shortage at the time curtailed manufacture of some costume jewelry. I used bright colors and interesting motifs, even some images from Hieroglyphics we had learned when studying ancient Egypt at C&C. Before my daughter was born, I bought a guitar and took ten lessons in order to sing to her the music I learned at C&C. In “Braddie’s” class (Margaret Bradford Boni), I had been thrilled with learning the folk songs and their background history. Not one of my friends outside of the School knew such wonderful songs. I still know dozens of them by heart. Living in Massachusetts with my veterinarian husband, I raised both of my kids on these song and recorder music too! My daughter sings and plays piano on cruise ships and clubs all over the world. People chat with her between songs and when she hears a Scottish accent she plays and sings The Skye Boat Song I learned from Braddie. Amid the chatter and laughter in nightclubs Annie tells me that when she sings "speed bonnie boat like a bird on the wing..." the Scottish folk are so deeply touched, the tears flow down their cheeks. They never would expect to hear that song when away from home. In the early sixties, just as folk music was finally captivating the American public, I got invited to do fund-raisers and various gigs with my guitar and repertoire of songs learned at C&C. I had given up making ceramic jewelry when an allergy caused my hands to break out in painful sores. No Problem. I created a new career while assisting my husband’s struggling Animal Hospital. One of my happiest times at C&C was carving linoleum blocks for the printing press. What a rich experience! We set type by hand and carved lino-blocks to illustrate our own poetry for the class magazine. I loved every minute! With those memories I printed my first linen calendar in 1958. Having first carved the illustrations using the 12 signs of the Zodiac for motifs, I then had to carve another 12 blocks with every month and all the numerals—backwards! My kids would stand on each inked block placed over the linen on the floor to make each print. Laborious, but fun! We turned out 30 that first year to give as Christmas presents. Quickly I learned how to do silk-screen printing by hand, which was MUCH faster. In the years following, I got orders from colleges, banks, insurance companies, etc. to custom design and print unique linen calendars that they gave as gifts to special customers, or with colleges, to donors of most generous contributions. Over the years, I printed many thousand wall-hangings and employed all the neighborhood kids to assemble, roll, and tube the linen. 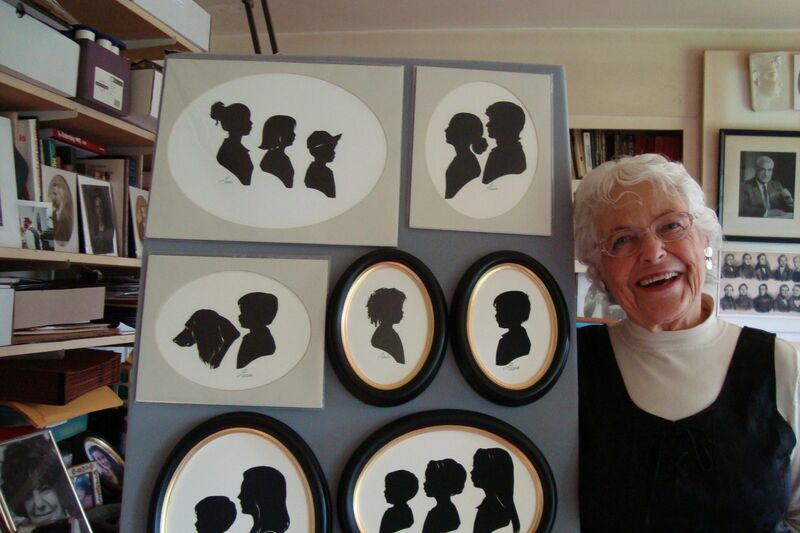 For the past 25 years, I have been earning my way as a portrait painter and silhouette artist (www.silhouettes-by-carol.com). I go to Arts & Crafts Festivals around New England as well as fund-raiser events for schools and museums. At age 86, my life is full and very exciting. I try to be a good citizen by voting and contributing to organizations. My parents were living examples, plus the philosophy I gleaned from C&C, impressed upon me the importance of working for just causes to bring about change.